Hunski Hardwoods has a fine selection of walnut lumber. You will find Black walnut and Claro walnut to choose from. They have similar, yet distinct characteristics. Black walnut lumber has a fine but open grain, and a medium coarse texture. Its color ranges from light to dark or chocolate brown. Woodworkers find it excellent to work with, including for turning and carving. The Black walnut tree is a moderate size, growing to about 100 feet tall, with a trunk up to 60 inches in diameter. Its wood is valued for crafting fine furniture, gun stocks, cabinetry, hardwood flooring, and musical instruments. The Claro walnut tree grows in Northern California, and grows to between 30 and 60 feet tall. 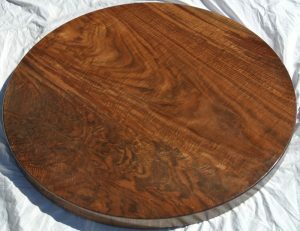 Its wood is medium textured, similar to American Black walnut. Its color and grain pattern is variegated. It typically has more color and grain variation than Black walnut. the heartwood ranges in color from light brown to dark chocolate brown, sometimes with darker streaks. The color sometimes has gray, purple or reddish tones. Other names for Claro walnut include Bastogne walnut and California walnut. This beautiful wood is commonly used to make fine furniture, turning wood, and musical instruments. Hunski Hardwoods carries a very large selection of walnut hardwood lumber. All walnut lumber is cut with quality and figure in mind, resulting in exceptional lumber for whatever your needs may be.